Students learn a huge amount of content in this lesson but do so in an engaging manner. The lesson begins with the starter activity in which students are invited to create a VENN diagram to compare two characters - one from the Golden Years and one from Nazi Germany. 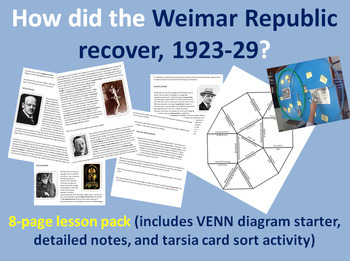 This introduces the idea of social change and economic recovery between 1923-29 and the class then work through a detailed set of notes in order to gain subject knowledge. The main task is a Tarsia shape card sort activity and students consolidate their subject knowledge through this.